Your satisfaction are very important for us.We strive to offer you the best value and service possible.Please let me know if you have any issue about our products,our team will provide best service to you. Please Contact us if you have any questions or need any help!We will provide the best service to you in 12 hours. Size information (inch), don't forget to keep inches space to wear it comfortable per your actual need. Size already converted to be U.S, order the size you normally wear is fine.Please ingnore the tag size you receive. Notes: color differences allowed for light effects. Machine Wash Cold,Do Not Bleach. 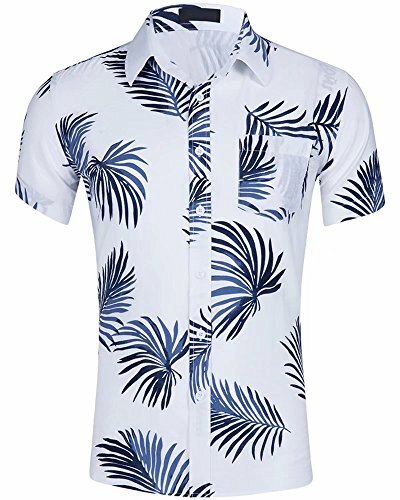 Super stylish men's tropical floral printed dress shirt. Great for: Fashion everyday casual wear, formal work, business, party, wedding and any celebration in summer. Fits for man and junior boys both. If you have any questions about this product by HENGAO, contact us by completing and submitting the form below. If you are looking for a specif part number, please include it with your message.